What are the real reason(s) Toys R Us went bankrupt? 40 years ago if you needed to buy something (a toy in this case) you needed to go to a store and physically purchase it (with the exception of a few mail order catalogues accounting for very little of sales). The internet changed all that. Many people point to Amazon, but there are hundreds of online retailers that allow you to purchase almost any item. If a store provides an interesting or amazing experience in person retail can thrive. Apple is probably the best example of this, but other strong contenders include places like BestBuy and to an extent some stores like Dicks Sporting Goods. The Toys ‘R' Us model relied on seasonal sales driving their year round operations. In contrast, competition like Walmart and Target focused on sales year-round, offering discounts to drive steady traffic. As a result, during the holiday season, Toys ‘R' Us competition was able to cut their prices to the point where Toys ‘R' Us became much more expensive than alternatives. As a UBS analyst put it, the model quickly became outdated and unsustainable. Also referring to Walmart and Target-Toys ‘R' Us didn't keep up with its competition because it refused to diversify enough. One example of Toys ‘R' Us's successful diversification that they deserve credit for: baby supplies (i.e. diapers, wipes, etc.) However, beyond the baby market, Toys ‘R' Us failed to truly expand into a variety of other niches. In contrast, Walmart and Target offered a wide range of clothes, groceries, and even pharmaceuticals. As a result, competitors received more foot traffic-parents would bring their children to Walmart to buy groceries and leave with groceries + toys. Amazon Matters-But Not 100% For Toys. 2. Usually isn't browsing Amazon with their child on their lap. So the child won't tell them that they want that shiny toy while the parent browses for a new camera. Additionally, part of toy shopping's appeal is the experience that a child has when messing around with a bunch of toys until they pick the one that they like the most. They could have offered "discovery rooms." Or "Plug and play" rooms with digital devices. Or spaces designated to create your own TV show like an HGTV studio for kids using the mini-kitchen sets they sell. Then kids and their parents could upload to their own Facebook pages and feature them on YouTube. Do I smell viral videos? Kids and the clever things they say and do? "Is the toy industry in permanent decline?" "Has the iPad and mobile gaming took away the entertainment from toys"
"Is this about distribution and price?" At the moment, I'm lending towards the latter, but it isn't the main cause for why the bankruptcy of Toys "R" Us. Their bankruptcy is created by a sequence of events, which led to this moment of doom. Let's begin with what caused the bankruptcy of Toys "R" Us. What caused the bankruptcy of Toys "R" Us? Toys "R" Us filed for bankruptcy in 18th September and was one of the biggest toys distributors in the world. Sales peaked at $13.9bn in 2012. 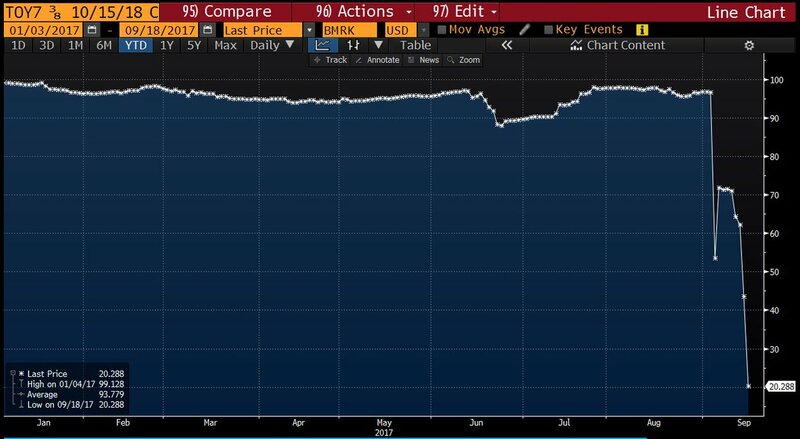 The events unfolded when their bonds (trading as high as 97 cents on 4th September) suddenly took a 78% plunge to below 21 cents, a signal that shareholders are screwed. But, Toys "R" Us problems go back a long time ago, before it went into administration. If one looks at their balance sheet, one could spot that it has long-term debt of $5.2bn, along with negative equity of $1.3bn. Meanwhile, it made a quarterly net loss of $164 million. So, a mix of negative earnings, negative equity and high debt means a toxic mixture that is becoming unhealthy. 1). Sales were declining steadily; - While the sector grew 5% per annum for the past five years. Toys "R" Us saw a 15% drop in sales in the same period. This tells us the company is losing market share while the sector grew. 2). Can't pay off interest; - when a business is making losses it had to pay off interest in other ways such as borrowing more money, which increases interest costs. A self-defeating vicious cycle! 3). Debt maturity; - the biggest factor and a major cause of bankruptcy. Any business wants to rollover debt is reviewed by the bank investment managers. If they see no improvement in operations or if the business declines, then borrowing rates rises, which will depress the value of market equity. "In 2018, $400m is due. In 2019, $2.6bn is due. In 2020, $1.36bn is due." Without improvement in operational performance, the debt mountain sealed the fate of the toy company and their shareholders. Toy's R Us made one mistake that doomed them, ten years before they failed. Without making this one single mistake, they would have had awesome revenue each year, they would never have been sold to private equity, etc. My dad loves to tell a story about a town in the old west. When the railroad was coming through, they decided to try to squeeze every penny out of the railroad company. They raised the prices and taxes. The railroad company decided to just build in another town, which welcomed them. The original town then missed out on all the commerce and growth, and eventually faded from the map, while the other town prospered. This is sort of the same story. Amazon then decided to expand their business into the territory of eBay. Allowing other sellers to utilize their platform for a small fee. That meant that there would now be toys offered on Amazon that were not fulfilled by Toys R Us, however Toys R Us was still getting a great deal for it. TRU was the first choice seller of all the products it carried on a platform that would continue to become bigger and bigger. So the two divorced over the issue and each went their separate way. Amazon continues to innovate and diversify their business. They start Prime and offer free shipping on products, delivery on Sunday, etc, etc... Their business grew by 2,500%. Toy's R Us, for all the bile and arrogance of its leadership that believed that they didn't need the book website, what with all its customer service focus, and constantly making smart investments. The next year TRU was sold to the equity firms and closed a third of its stores, this is where everyone likes to start the story. However, would we be telling that story today if Toys R Us had been fulfilling 80–99% of Amazon's toy sales each year? I doubt it. What is the purpose of a stablecoin on that is tied to the value of the US Dollar? Are farts denser than air? Assuming that I am not crazy, I am pretty sure I saw a spider survive in a microwave for 2:00 minutes. How is that possible? Do you find any wisdom in TV Commercials? I do not work for and have not worked for Toy R Us but I have seen enough of this to know one truth - the reason almost all companies like this go under is bad management. It would seem that with the KKR and others buyout they would have brought an excellent management team on board but depending on how that is done it can actually be worse. Sometimes these high end teams come with an extremely high price tag. Sometimes in situations like this the top execs are retained with extremely lucrative contracts which hurts a company's ability to get back on its feet. The thing I look at is Wal Mart, Amazon and Toys R Us are all buying from the same suppliers and sell the same products and have similar basic overhead. So, what this really means is that Wal Mart and Amazons leadership team is better at positioning their companies in this space. Back to leadership - Great leadership is vastly under-rated BUT a great leader in one area may not be a great leader in another area. Some people operate under the misconception that a great leader can be a great leader no matter where you plug them in. The missing link is the experience in the field you grow up in is what you can leverage to be a great leader within that space. A great leader at a retail store could be a great leader and any of dozens of other great store chains, but someone who is great at running a banking conglomerate would not be a great leader in a retail store chain unless they started off 4 or 5 levels down and over 7–8 years worked their way up. Great leadership would spot trends in advance, be good at recognizing competition, and developing a strategy to be ahead of the competition. The larger the company the more intensely focused the President/CEO has to be on these matters. The COO has to make sure that every ounce of efficiency is squeezed out of the cost of doing business and the CFO has to make sure that AR and AP are strategically planned out. Every store has to be scrutinized for ROI. Store managers have to have the proper training to make sure they run the store efficiently. It is a massive undertaking for someone like KKR to walk into a bad situation and add $ 5 billion in debt and then lead it out of trouble. There are a lot of reasons why Toys"R"Us went bankrupt, but the simple answer is that the owners (KKR, Bain and Vornado Realty Trust) made a gamble and lost. That's combined with a secret that few outside of the industry knew - Babies"R"Us tanked everything. In 2005, the U.S. toy business was weak (hammered by Walmart), but the Babies"R"Us business was keeping the company afloat. In 2010, the company filed for an IPO, but all of the above changed. The toy business had seen significant growth in sales and market share vs. competitors. But, the baby business never saw Buy Buy Baby or Amazon coming after it and became an anchor around the company. Also, while the business was growing, a substantial piece of the numbers were based on combining Toys and Babies stores together. You saw a double-digit sales increase, but that level of increase couldn't be annualized. And, it essentially created a 5-year plan that could have sustained the company through an IPO in 2010 - 2012. Also, this was in the middle of the financial crisis. So, while the IPO was filed, some of the owners wanted to wait until they could get more money. That pushed back the execution of the IPO, while, unfortunately, Toys"R"Us sales started to decline. That made them less attractive to investors, and ultimately led to them rescinding the intent to file the IPO in 2013 (I don't know the technical terms). Delaying the IPO for better market conditions is the bet the owners lost on. And, if they had filed, Toys"R"Us could have paid its debt. So, the reason the liquidation is happening now is that last September, they retained a bankruptcy lawyer (I don't know the specifics, but I believe they were concerned about the possibility of missing a payment). That set off a chain reaction of manufacturers not shipping products, which destroyed their holiday sales. That led to nobody being willing to lend them money, which led to liquidation. And here we are. Who was the most useful hero in Avengers: Infinity War? How long does it take for a person to drown? What's your reaction on Sachin's (movie) trailer? 5741 | Do ENTPs like to cuddle? 5866 | Why does Netflix get new movies slower than Blockbuster and Redbox? 4014 | Which is the best vaccine to prevent pneumonia for seniors over 65, is it prevnar or pneumovax? 7172 | Why do some people enjoy horror and torture movies? 9662 | If every Marvel hero went up against every DC superhero, which side would end up winning and why? 1817 | What is the scariest thing you've experienced while flying in a plane? 7102 | How complex is rocket science actually? Why do you think life is cruel to you? Did the astronauts who flew to the moon have a plan in place in case they got stuck there or jettisoned out into space? Does the company DC Comics, Inc. produce the movies based on DC characters? What are the problems faced by most people in normal day-to-day life? Which of the two is a better read: The Lord of the Rings or A Song of Ice and Fire? Which is the happiest moment in your life with friends? Is Dangal the worst movie ever? What are the best Bollywood movies of the 1960s?